A man has reportedly shot himself dead at Olivia Newton-John’s Florida home. Police responded to a possible suicide at the $5.6 million house in Jupiter at 12.15 p.m. on Monday and Tequesta Fire Rescue confirmed they found a man’s body at the scene. Sgt. Scott Pascarella from the Jupiter Police Department said the man is not related to the homeowners and does not live there, the Palm Beach Post reported. Olivia Newton-John, 64, and her husband, businessman John Easterling, 61, were out of town at the time of the shooting, officials said. Contractors were at the house carrying out repairs and one contractor was seen crying there this afternoon, the Palm Beach Post reported. Neighbors said they have not seen Olivia Newton-John at the home, which is being sold, in a while. Police have released few details about the call and have not released an identity of the man, who is believed to have shot himself in the head. While officials said it appears to be a suicide, Scott Pascarella said police are treating it as a death investigation. The medical examiner and Jupiter Inlet Colony Police remain at the scene. 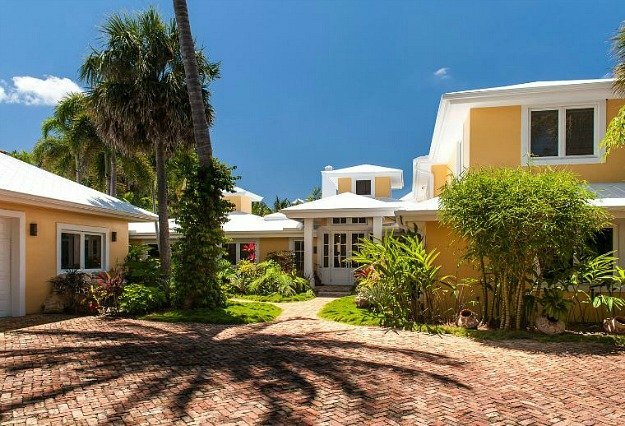 Comedian Rosie O’Donnell, who sold her own Miami mansion for $16.5 million in June, is reportedly under contract to buy the home. One website said the sale was worth $5.6 million. Jupiter Inlet Colony is a coastal community in Palm Beach with around 360 residents and 240 homes.